Hi guys! 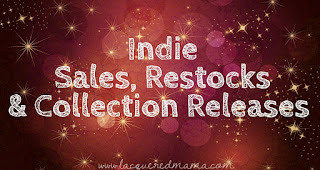 Today I have a gorgeous Spring collection to share with you! 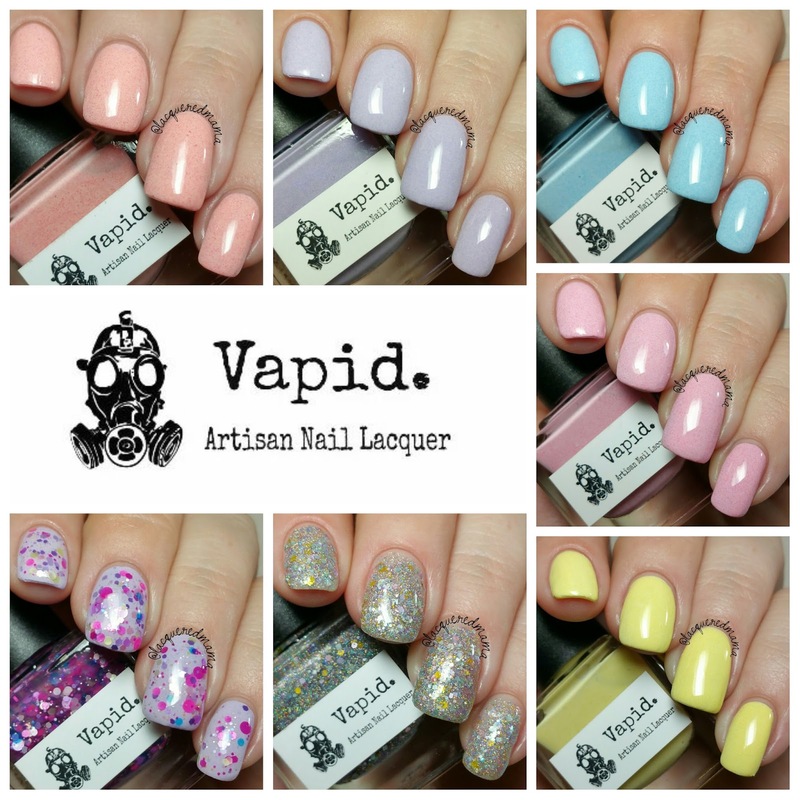 The Goddess of Spring Collection by Vapid Lacquer includes five beautiful pastel toned cremes that are each filled with corresponding colored flecks and a light hint of holo; as well as two fun glitters! This is a first of its kind for Vapid. Krys is not generally known for girly or ultra feminine colors, but I think she has definitely changed that with this collection! Let's take a look! 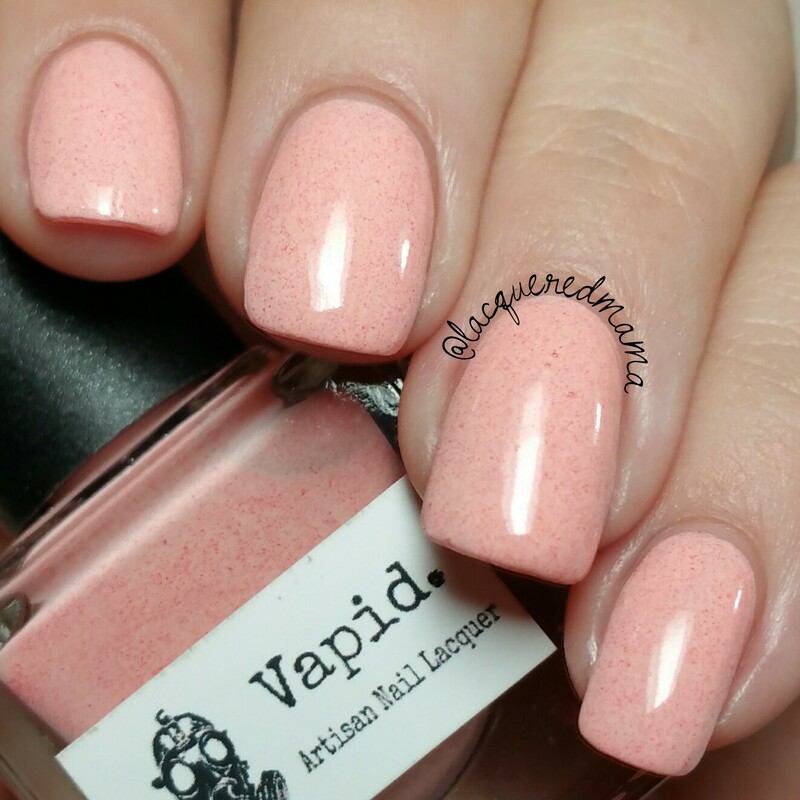 Persephone is a pale corally orange creme filled with a deeper orange toned flecks and a hint of sparkle! For my photos I did two coats plus topcoat; though, you may be able to get away with just one depending on your application. Saraswati is a gorgeous lavender toned creme filled with darker purple specks and a beautiful purple flash that was very camera shy. I couldn't catch it in a photo to save my life! Again I did two coats plus topcoat. 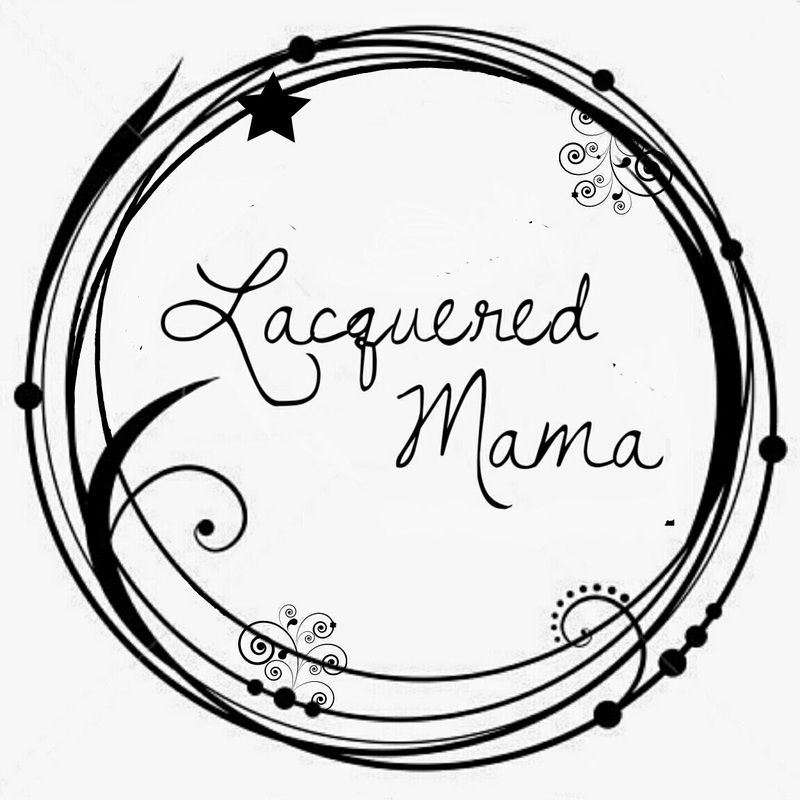 This is another that is on the edge of being a one coater! Ostara is a lovely sunshine yellow creme. 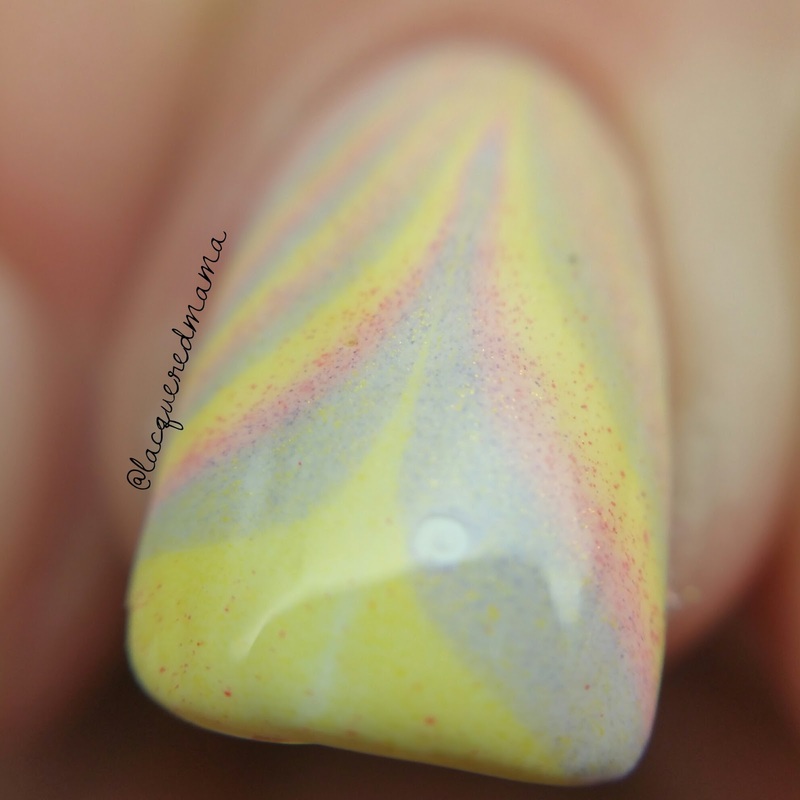 This one is filled with a ton of yellow flecks and a hint of shimmery sparkle! 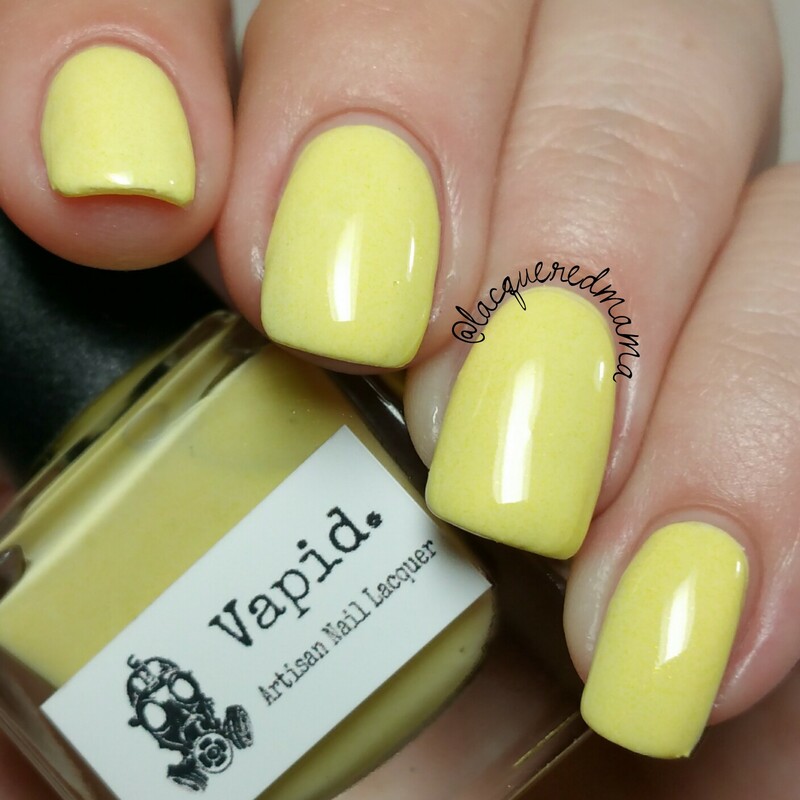 Perfect pastel yellow formula! 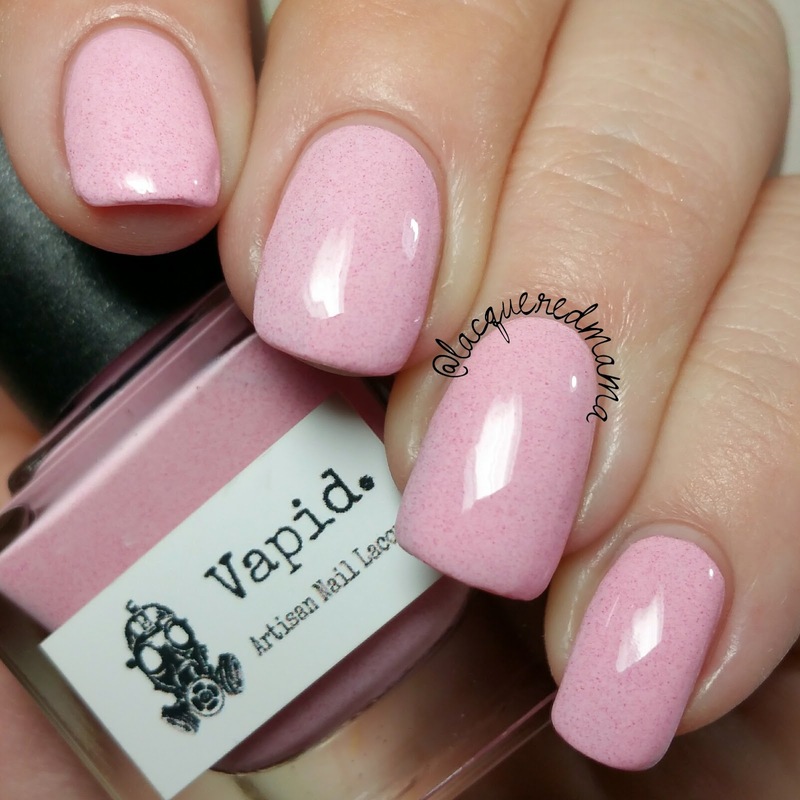 Not thick at all and is opaque in just two coats! 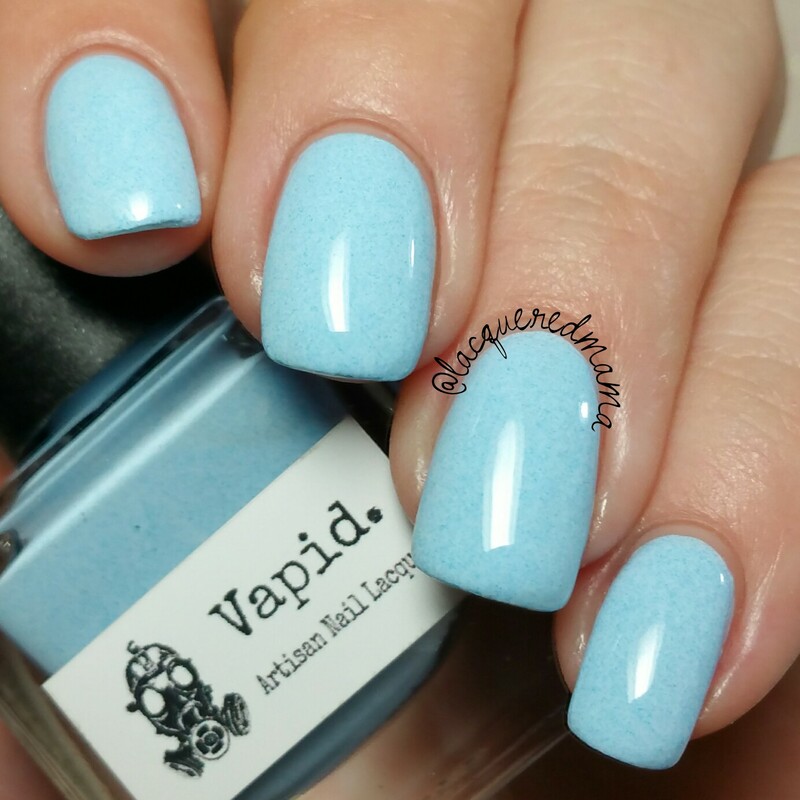 Aphrodite is a robin's egg blue creme filled with darker blue specks and a beautiful blue shimmer! Here I did both one and two coats. Can you tell a difference? I can't! (Aphrodite was the goddess of love, desire and beauty! Aside from her natural beauty, she was said to also have a magical girdle that compelled everyone to desire her) I want one of those! Ishtar is beautiful pastel pink creme with a smattering of red/dark pink specks and a touch of sparkle! 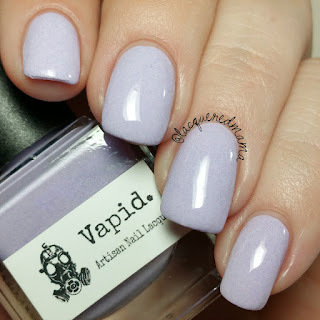 Wonderful formula, needing just two coats plus topcoat! 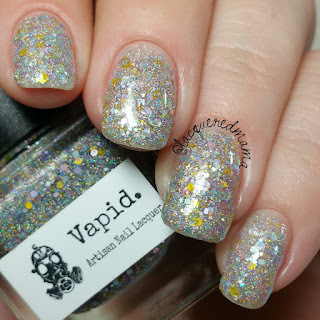 The last two polishes are fun little glitters that aren't part of the actual spring collection, but still make a great addition to the season for sure! Pretty Pretty Princess is a a clear jelly base loaded with holo micro glitters, holo flakies and a pastel rainbow of various sized hex glitters. Super pretty! It can be worn as a topper or opaque on its own in two to three coats. Here I did three thin coats by itself! For not generally doing glitter polishes, Krys knocked this one out of the park! 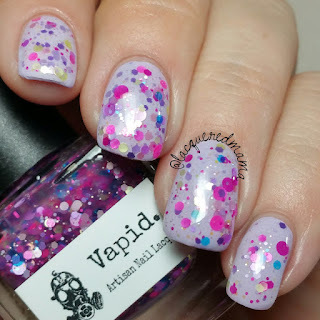 Freckled Faerie is a clear jelly base filled with bright pops of fuchsia, aqua, purple, yellow, pink glitters in various sizes. Here I did two thin coats over Saraswati. 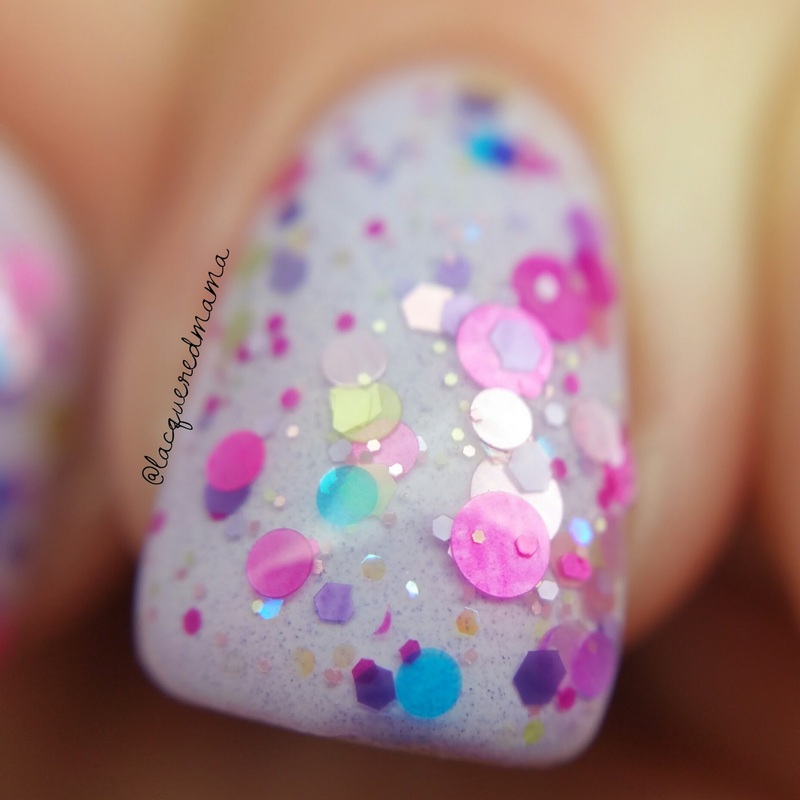 Great glitter payoff, with absolutely no swirling or fishing! Do they watermarble and stamp? YES! 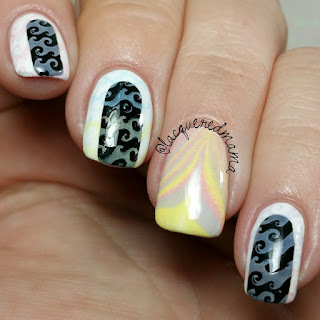 They watermarble perfectly! As for the stamping; while they aren't super vibrant once stamped, they do still show up pretty well for pastels that aren't really made for stamping. Gorgeous Spring Collection and fantastic formulas as always ! These will all be available in Vapid Lacquer's shop March 26th! Mark your calenders! I also wanted to note, that there has previously been frustration over the craziness surrounding Vapid's restocks and releases. Things selling out and no cart holds specifically. Krys has come to realize that she is a hot commodity and is stocking really well now! This last restock still had top sellers available into the next day! It is a beauty for sure! I love the story as well! Oh! I love that these are just straight cremes. Seeing so much yellow this Spring has made my heart happy! wonderful swatches. 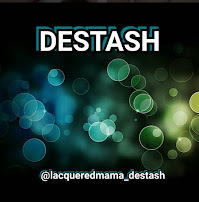 I am editing my pictures right now!